Samsung HT-D6750W review | What Hi-Fi? Samsung has led the way in home cinema systems in recent times, its products combining desirability with quality in equal – and formidable – measure. The HT-D6750W follows in some illustrious footsteps, its design and extensive specification winning it friends before a button has been pushed. Unlike most rival systems, the D6750W’s front and rear speakers are distinct (the fronts have more drivers). That’s because the top section of each tower includes a unique swivelling driver, designed to bounce sound off walls as part of Samsung’s ‘3D Sound Plus’ system. 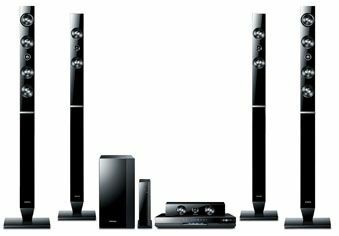 This uses the combination of sonic reflections and sophisticated processing to deliver – claims Samsung – the sonic effect of a true 7.1 system using what looks like a conventional 5.1 speaker set-up. It’s only partially successful. True, the soundfield certainly gets higher and wider, but at the expense of precision and realism. Like all systems reliant on reflected sound, you’ll find the results vary with the size and configuration of your living room, too: in free space, positioned well away from nearby surfaces, it works rather less well. Despite that, the bigger issue is the Samsung’s tonal balance, which is harsh at higher volumes. The so-called ‘super tweeters’ are designed to extend high-frequency performance, but on this evidence they’re over-enthusiastic, and no amount of running-in could calm them down. The sub extends usefully, thanks in no small measure to its inclusion of a 25cm passive radiator to complement its powered 16.5cm main drive unit, but the result is a balance where the frequency extremes are over-emphasised, to the detriment of cohesiveness. It’s a shame as, predictably, there’s plenty to admire here in other regards. 3D and 2D picture performance are fine, with edge definition and colour vitality being up to par with class standards. The fastest passages of action in X-Men: First Class can occasionally disturb the Samsung’s motion stability, but not to an extent that jars: it’s simply that the LG and Panasonic are both rather better. Elsewhere, streaming and network-sharing services are first-class, with a fine array of TV and movie options, plus plentiful social media applications. Connectivity is good, with built-in wi-fi plus DLNA compatibility, and to ease your installation, the rear speakers link into a wireless receiver module to avoid at least some cabling fuss. All’s well, then – save for that sound.